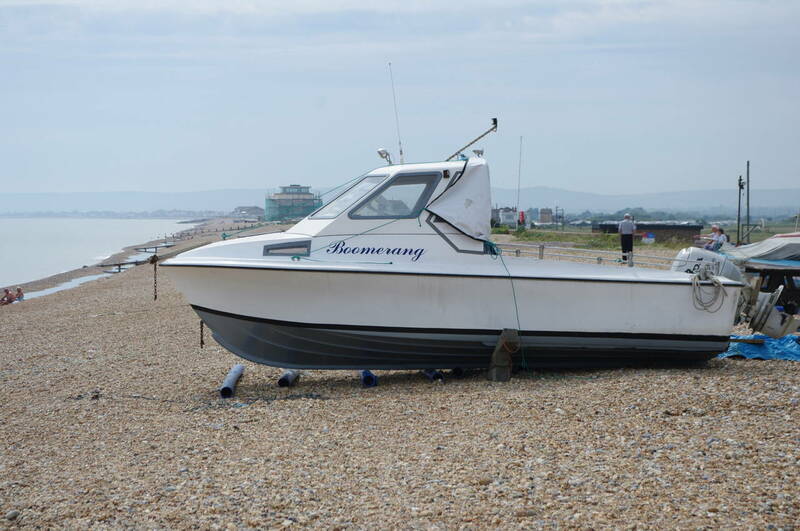 This walk is not an official long-distance walking route, but rather something I decided to try as a way of linking the end of the Saxon Shore Way at Hastings with the beginning of the South Downs Way at Eastbourne. 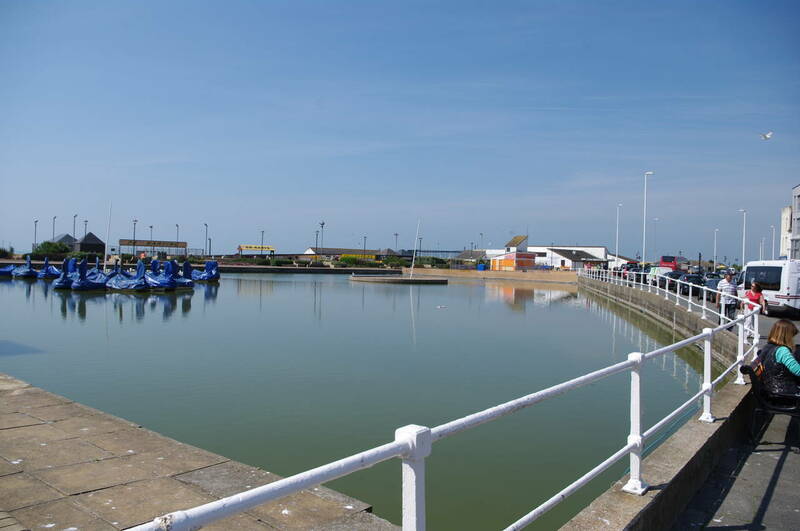 I began by the tall fisherman's huts at Hastings Harbour (picture 1) and headed east along the main beach-side road, soon passing a large amusement centre, a boating lake (picture 2) and a mini-golf course. Soon the curved building of Pelham Crescent appears on the other side of the road (picture 3), dwarfed by the bulk of West Hill, where William the Conqueror built his first castle on English soil. The ruins of the castle can still be visited today. 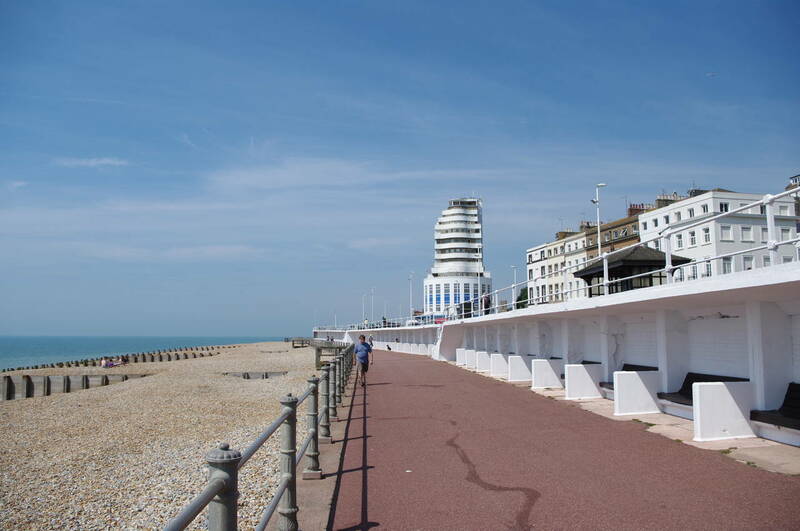 A little further along the road beyond several car parks, the footpath becomes a wide promenade and starts to run alongside the shingle beach (picture 4). This area was quite busy with walkers and cyclists on this sunny morning. 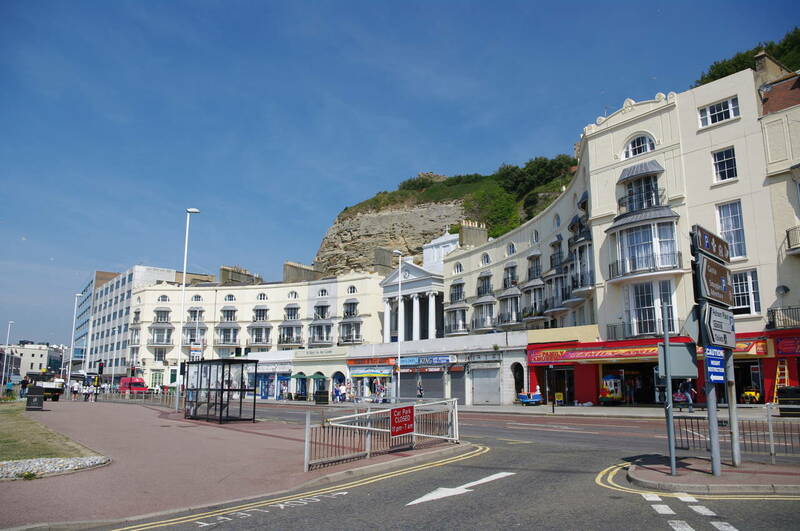 Opposite the landward end of the pier stands the White Rock Theatre and next to it the White Rock Hotel (picture 7), where I have stayed on both of my visits to the Hastings area. 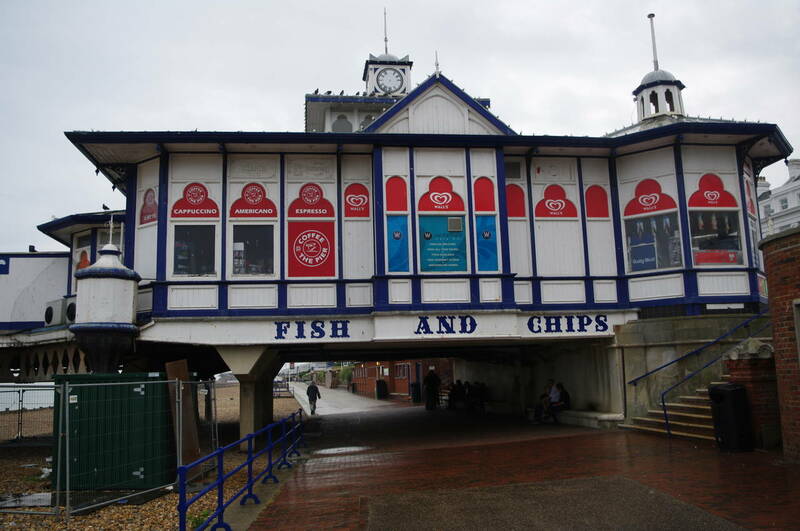 Just beyond the pier, the promenade divides in two, giving the choice of walking under a long covered section or walking along its roof, both with views over the beach and the pier. 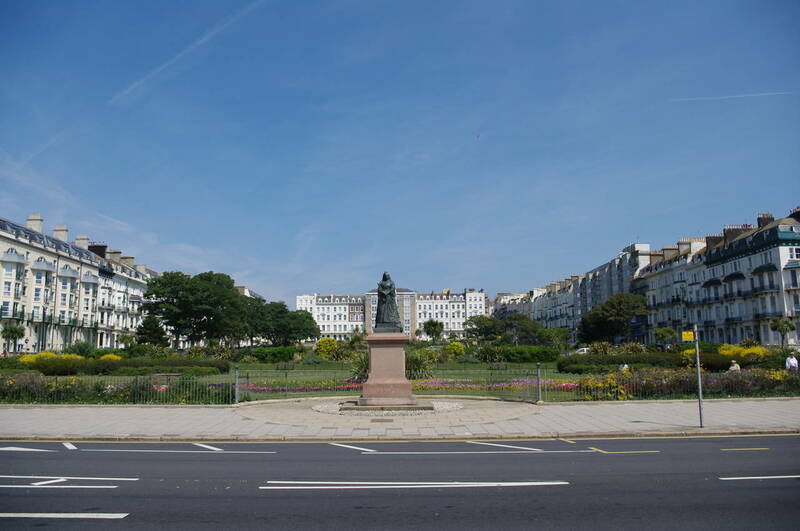 After about 500 metres, I emerged from the covered walkway opposite the large green expanse of the St Leonards Warrior Square (picture 8). 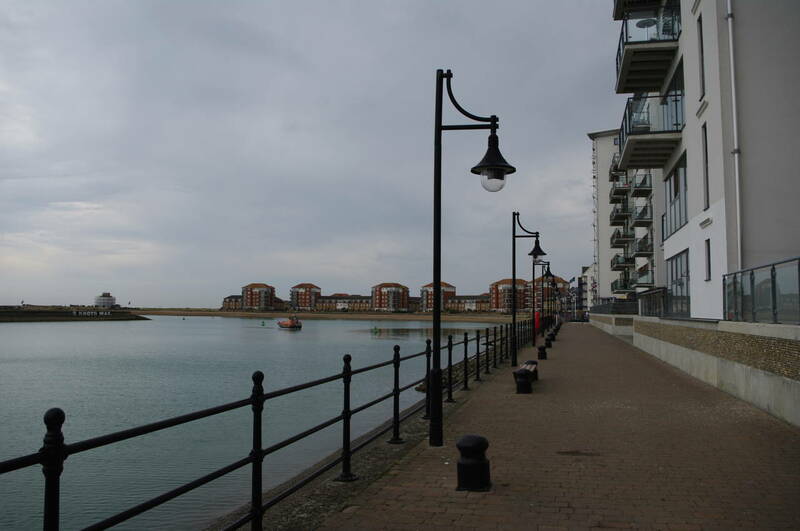 The next section of the promenade passes by a long line of shady benches above the beach, while a large modern apartment building dominates the view ahead (picture 9). Beyond this building, the promenade rises to rejoin the bicycle path, and I stopped here to buy an ice-cream from a truck that was parked on the path. 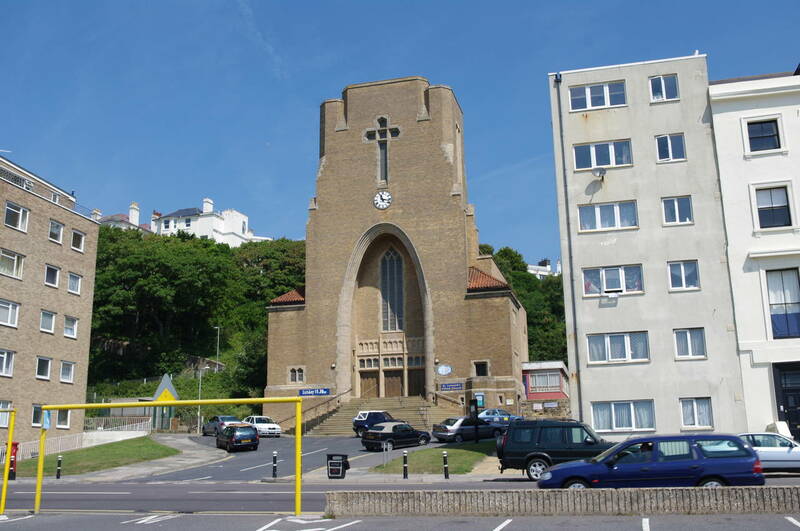 Behind the row of buildings across the road is higher ground and through a gap in the buildings I could see the unusual parish church and some of the cliff-top houses that overlook it (picture 10). 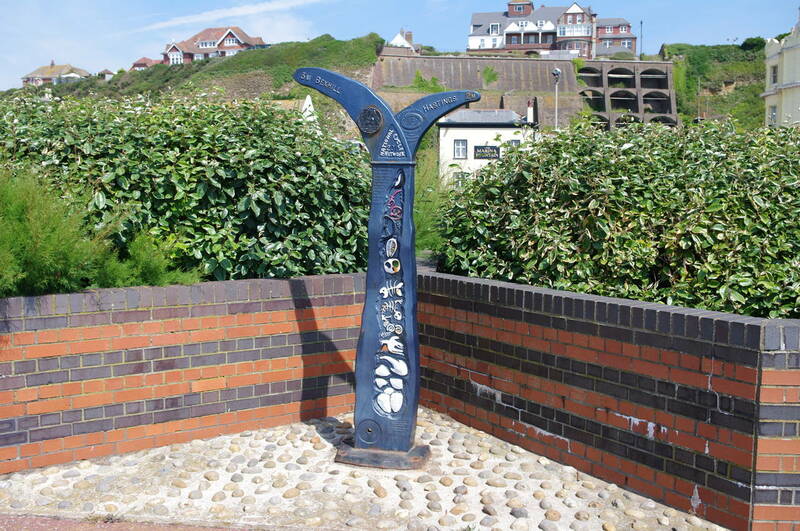 A little further along the path, I passed by an unusual looking fountain (picture 11) and just after the main road bears away from the beach, I found one of the distinctive signposts of the National Cycle Network standing next to the bicycle path (picture 12). 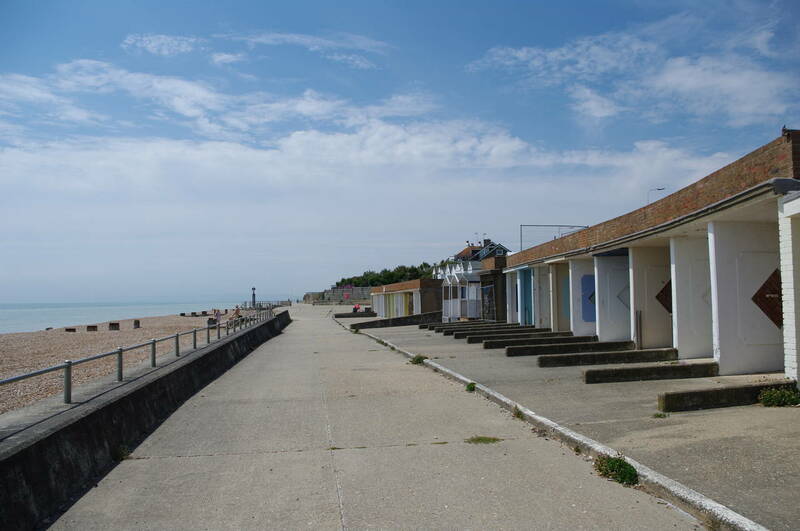 About 500 metres later the promenade ends, but the pedestrian and bicycle path continues along an area known as Bulverhythe, passing a row of beach huts and a tall ionic column that seemed entirely out of place (picture 13). 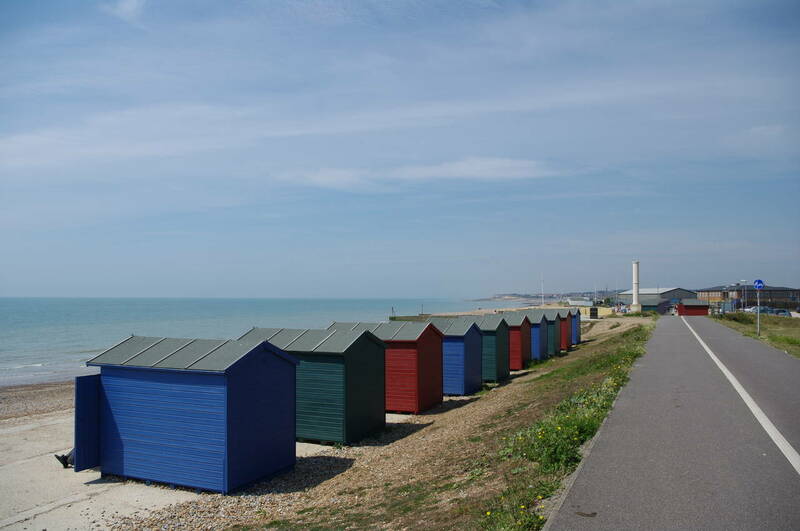 Beyond another large complex of beach huts, the bicycle path ends and I followed a short road to the left, soon finding myself walking along the shingle beach past a long line of slightly larger huts where there were a few dozen small boats pulled up onto the beach. 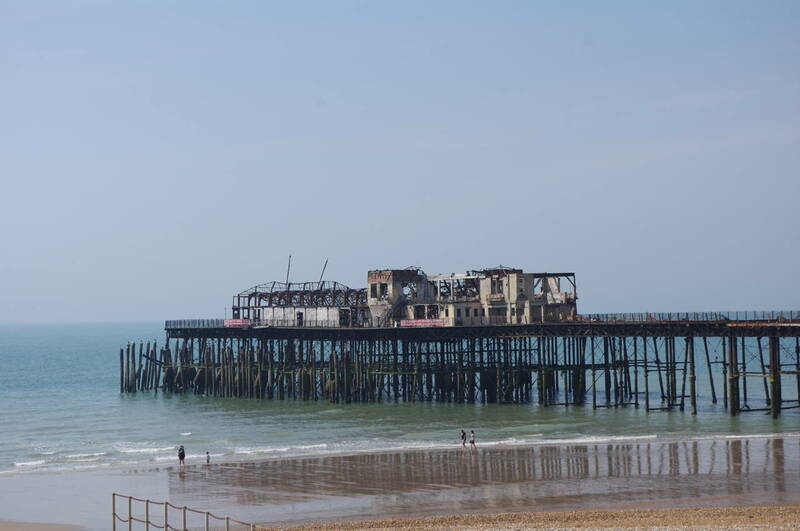 The coastal railway line runs parallel with the beach here, and the peace was somewhat disturbed by a group of welders working on the roof of a large train shed on the other side of the tracks. 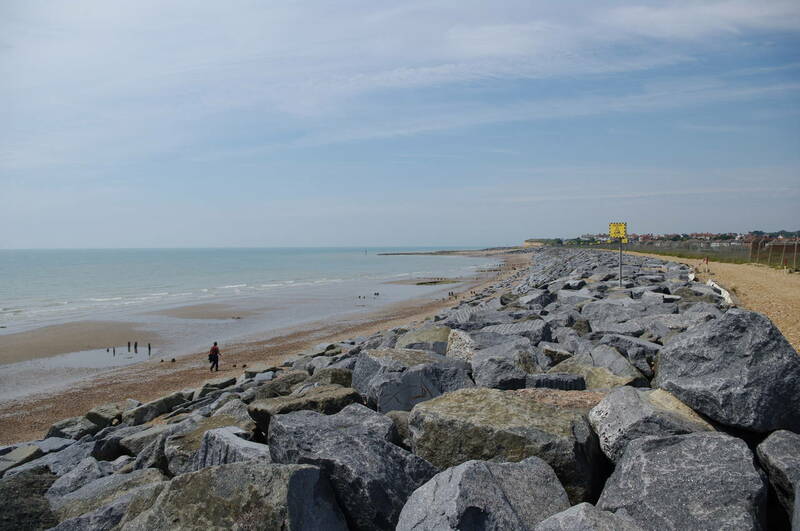 Part of the beach along this stretch was replaced by a long line of large rocks (picture 14), presumably placed to help defend the railway line against coastal erosion. 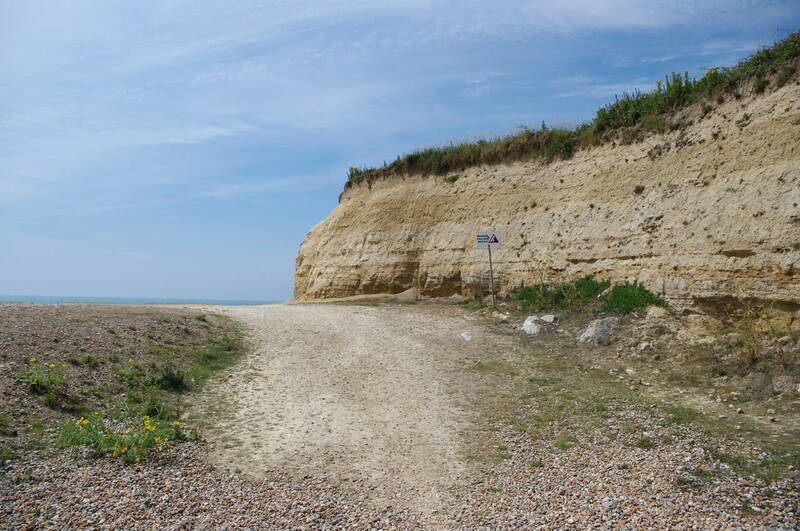 A few hundred metres further, I followed a well worn path along the foot of the low cliffs of Glyne Gap (picture 15), eventually reaching a small group of beach huts by a popular beach-side café. 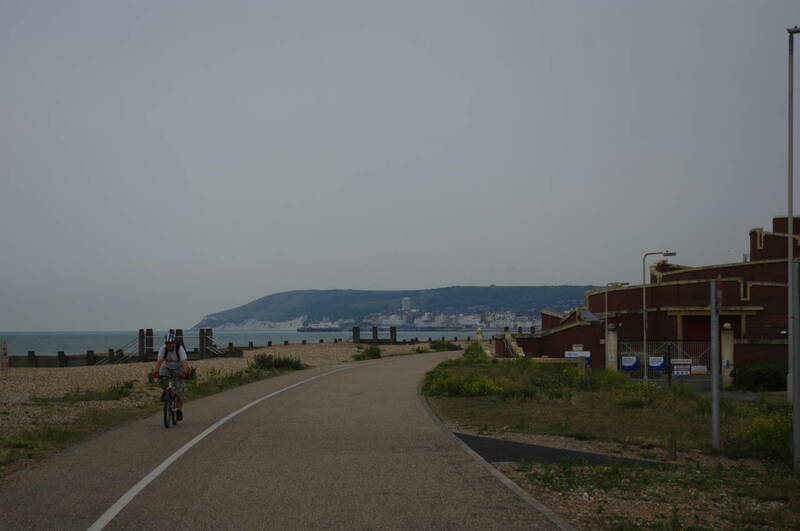 Here the bicycle path resumes and, finding it much easier to walk on than the shingle, I followed it as it climbed gently up to the grassy top of Galley Hill, where there was a good view ahead along the seafront of the town of Bexhill-on-Sea (picture 16). 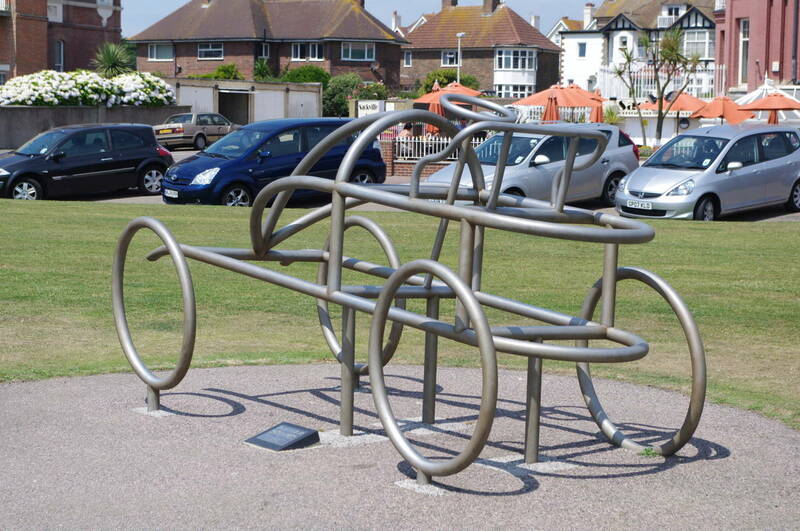 Heading downhill, I then joined the beach-side promenade of Bexhill, passing a long line of beach huts before stopping for another ice-cream at a grassy area between the promenade and the main road where I found an interesting metal sculpture (picture 17). 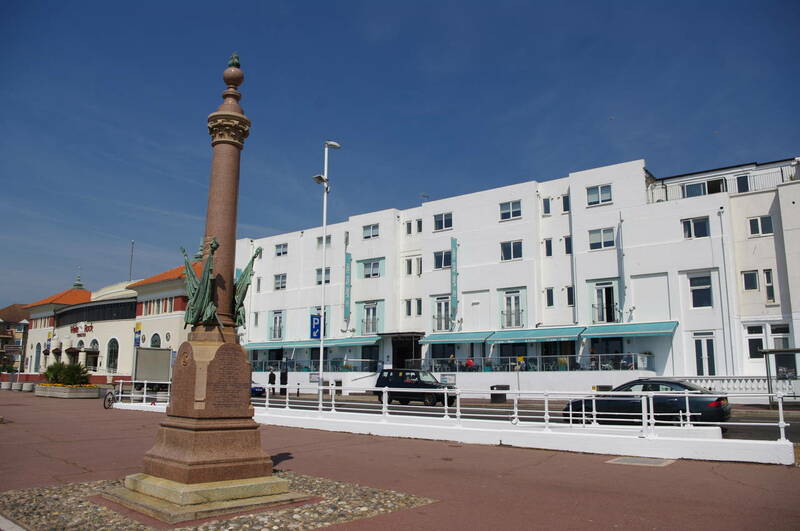 Bexhill seemed to be a good deal quieter and less touristy than Hastings, while also a bit more modern. 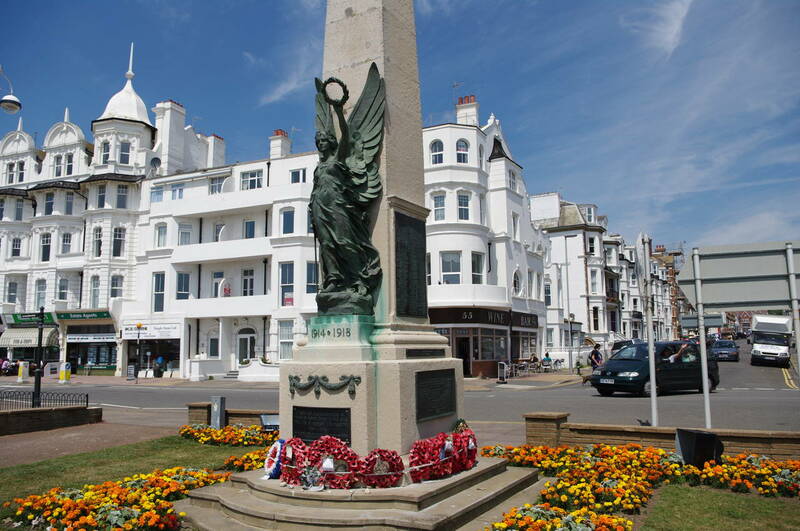 Moving on, I soon passed by the town's war memorial (picture 18), standing adjacent to a boatyard. At this point I could have headed left down a short lane to walk on the next section of the promenade, but as my research had revealed that part of the promenade could have been closed due to construction works, I instead stayed on the main road, bearing left at a roundabout to rejoin the promenade after about four hundred metres. 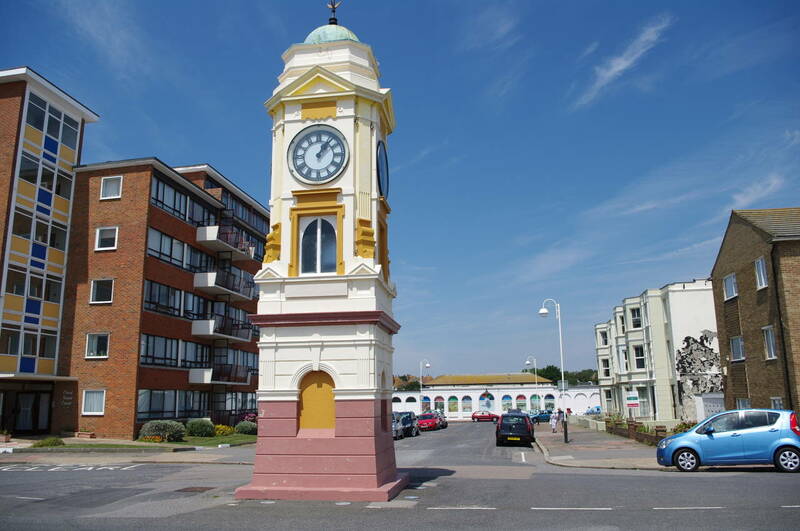 A couple of blocks further, I passed by an old clock tower, now somewhat marooned in the middle of the main road which runs parallel to the beach (picture 19). 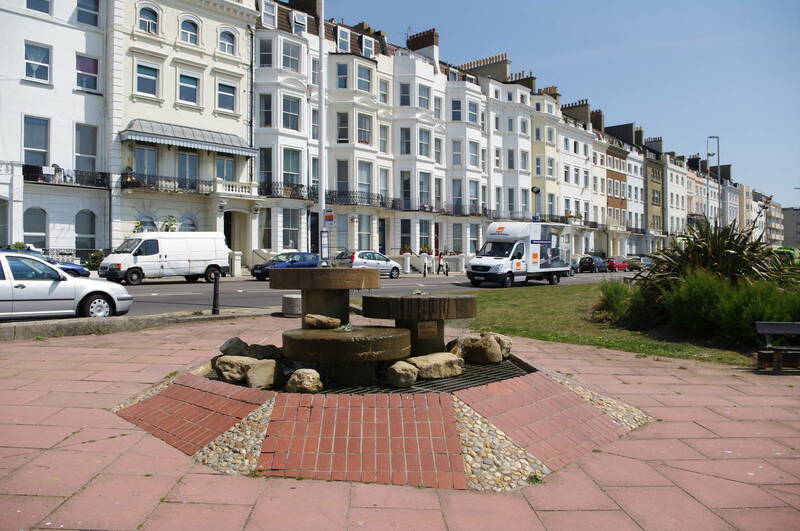 After passing a series of identical apartment buildings, the promenade ends and the main road bears away from the beach. 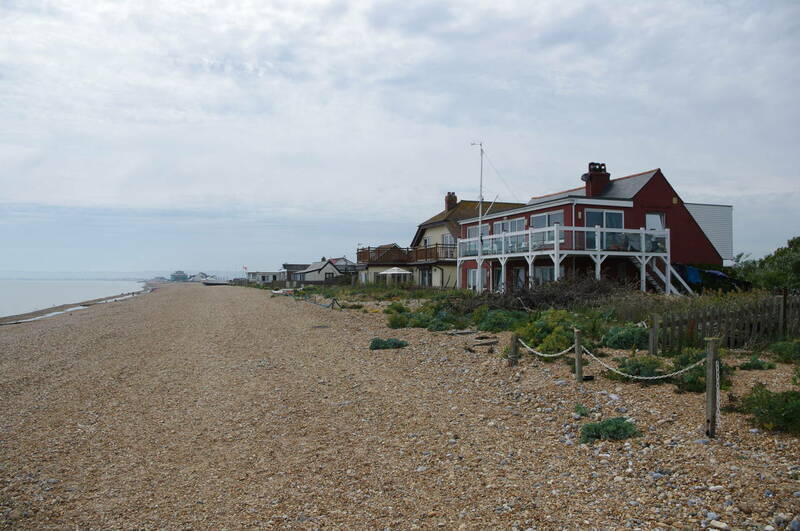 I crossed a short stretch of shingle to reach a beach-side footpath (picture 20), which passes a variety of beach huts and beach-side backyards and even a couple of seafront tennis courts. Eventually the footpath ended and I crossed another short section of shingle path to a flight of wooden steps up the low cliffs at Beaulieu Green. Looking ahead along the coast (picture 21), I could see that the weather was beginning to change and visibility across the bay towards Beachy Head had gotten significantly worse than half an hour previously. 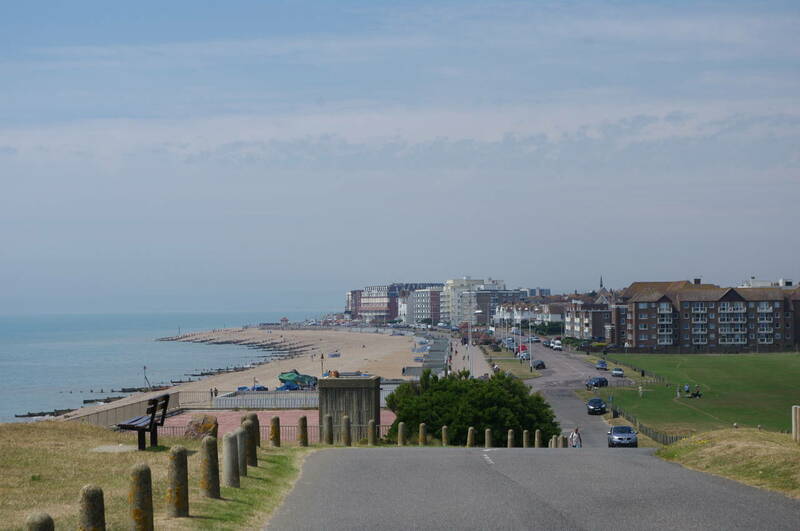 From this vantage point, there is no path above the beach, so I headed a short distance along Beaulieu Road to turn left into Cooden Road which I followed for about 300 metres to a roundabout by Cooden Beach. 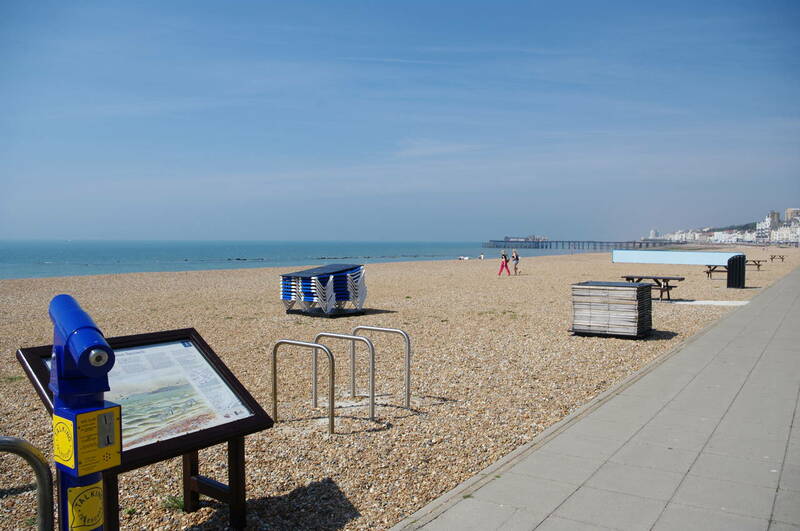 Before heading off along the beach, I first turned right for about 80 metres to the Cooden Beach railway station, where I acquired lunch at the attached convenience store. A short way along the beach, I sat down to eat my sandwiches and watched a local fisherman trying his luck in the calm water (picture 22). 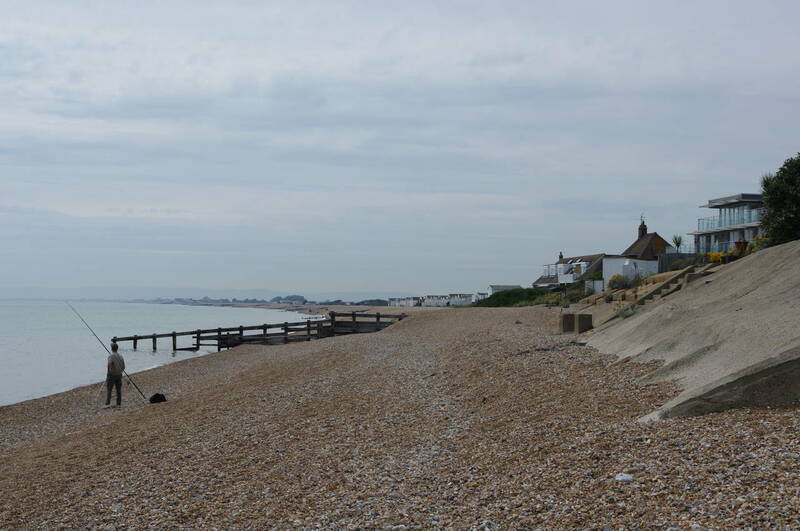 From Cooden Beach, I continued along the shingle bank for almost two and a half kilometres to the village of Normans Bay, presumbly named after William the Conqueror's Norman army, who landed nearby in September 1066 on their way to the Battle of Hastings. There were some quite impressive looking beachfront houses here (picture 23) along with a large mobile home park, and a little further along the beach I passed a small boat called "Boomerang" (picture 24), perhaps a sign that there were some other Australians about. 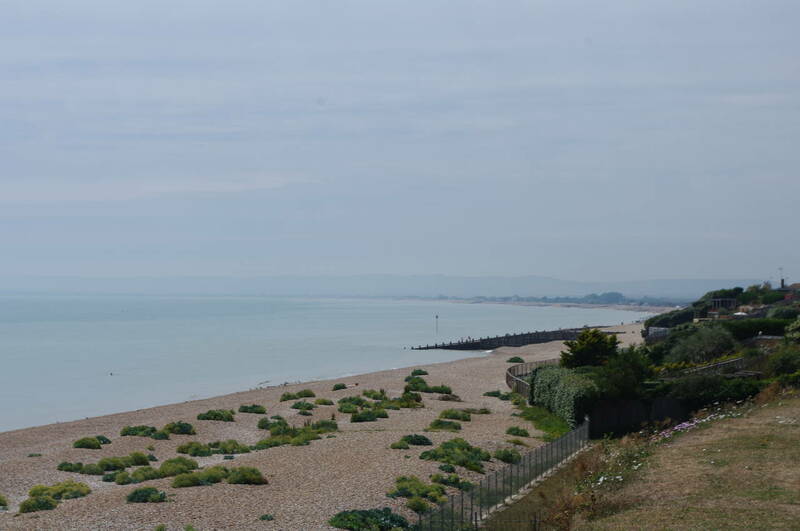 Another five hundred metres along the beach, I passed by a round martello tower, one of several along the south coast. Unfortunately, this one was clad in scaffolding and plastic, so I wasn't able to get any useful pictures of it. 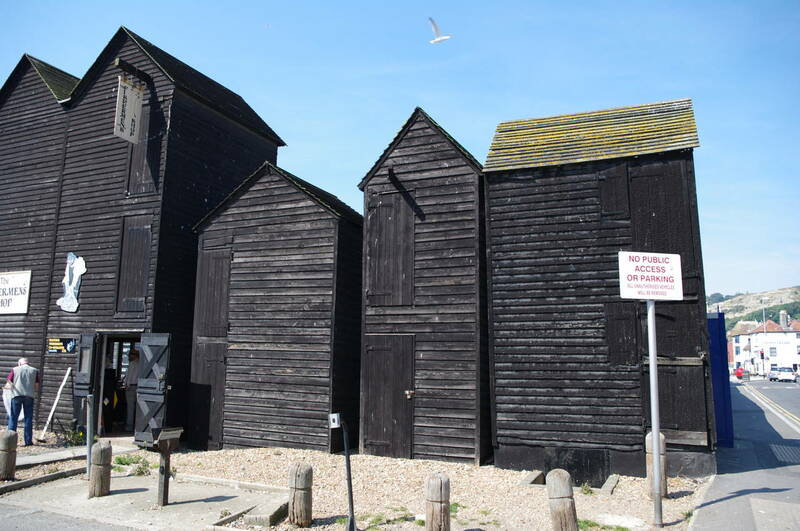 Martello towers were built as part of southern England's defences against possible invasions from the continent. 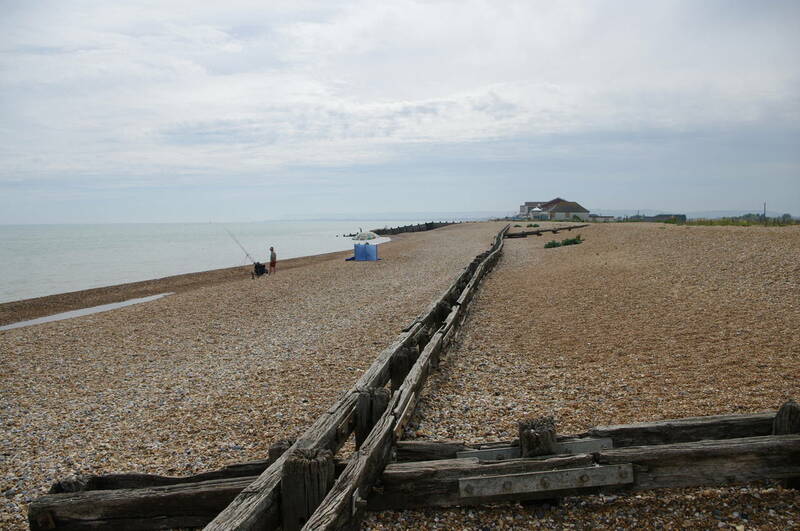 Along the next part of the beach there was a groyne built lengthwise along the beach in addition to the groynes stretching out into the water (picture 25), which is somewhat unusual. 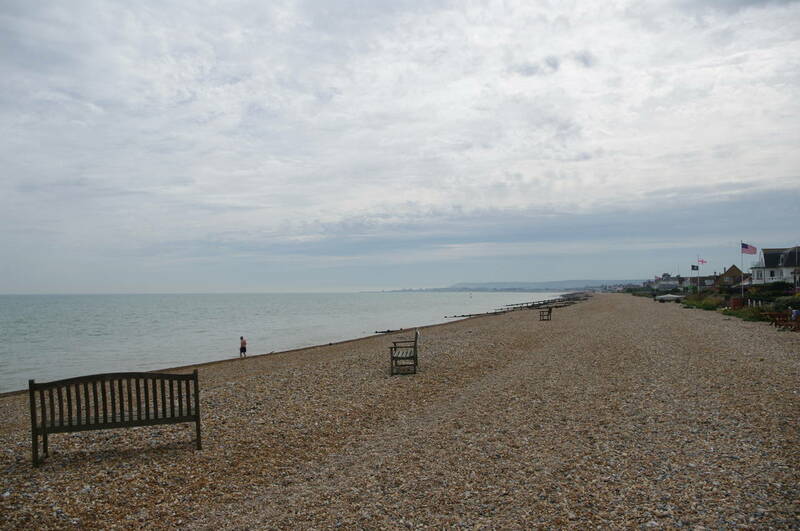 Beyond this I began to pass by the sizable settlement of Beachlands (picture 26), where I passed by a group of benches thoughtfully placed on the shingle. Beachlands forms one continuous built-up area with the town of Pevensey Bay, and along this part of the coast many of the beach-side houses were flying the English flag or the Union Jack, though I did also spot one large Canadian flag fluttering in the strong breeze. 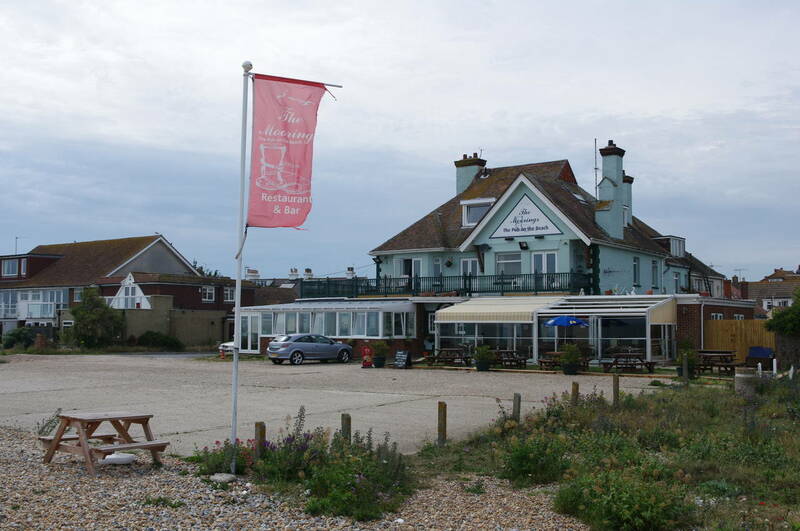 Just before reaching the beachside Moorings pub (picture 27), I also spotted a skull and crossbones flag bearing the text "Times flies when you're having rum." 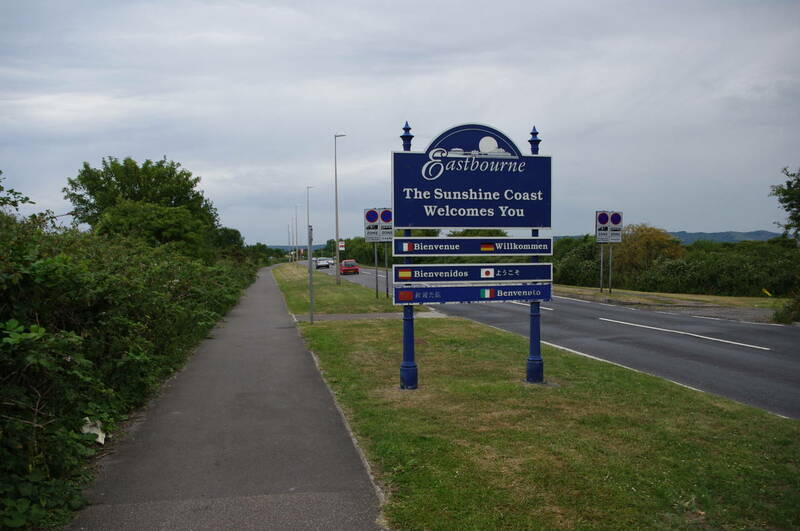 A few hundred metres beyond the pub I found the beach completely blocked by construction fencing and I was forced to divert from my intended route and follow the quiet Val Princeps Road out to the main A259 Eastbourne Road, where I soon passed a large sign indicating that I was entering the town of Eastbourne (picture 28), part of the "Sunshine Coast", somewhat ironic given both the deteriorating weather and the fact that I spent the first 19 years of my life living on Australia's Sunshine Coast. Having to take a diversion here was a little disappointing, as my map showed a line of three martello towers along the next stretch of beach. Reaching a gap in a hedge, I was able to leave the road and head across some waste ground to a small roundabout in a newish housing estate with an antipodean flavour in the street names. I headed south along Pacific Drive, passing streets such as Samoa Way (and noting a Brisbane Quay not far away on the map), turning right at the next roundabout and continuing to follow Pacific Drive up to a third roundabout, from which a footpath runs alongside a large, but empty, rectangular pool belonging to Sovereign Harbour (picture 29). A few minutes further along this path I crossed over the gates of two side-by-side locks (picture 30) that lead into a very large marina complex where literally hundreds of boats were moored. 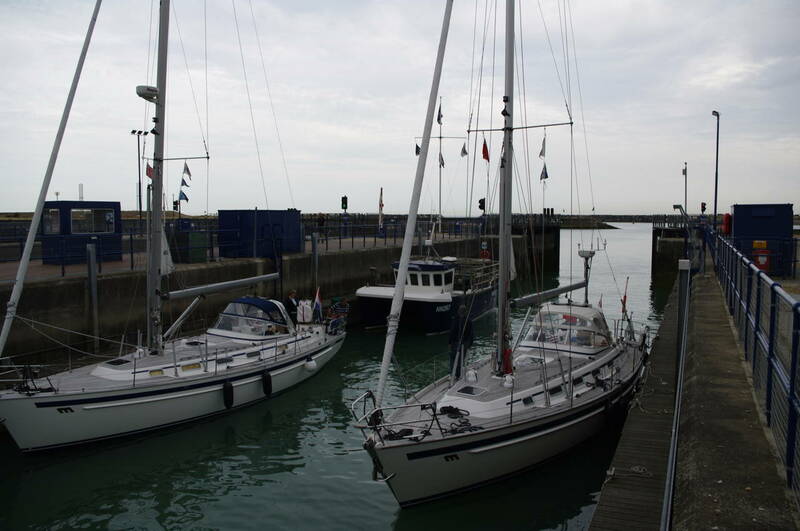 Once over the lock gates, I followed the footpath which curves left around beside the water towards another martello tower situated on Langney Point on the south side of the harbour entrance. Unfortunately this tower too was swathed in plastic and scaffolding -- so out of the five martello towers along this walk, I had not gotten a good look at any of them. 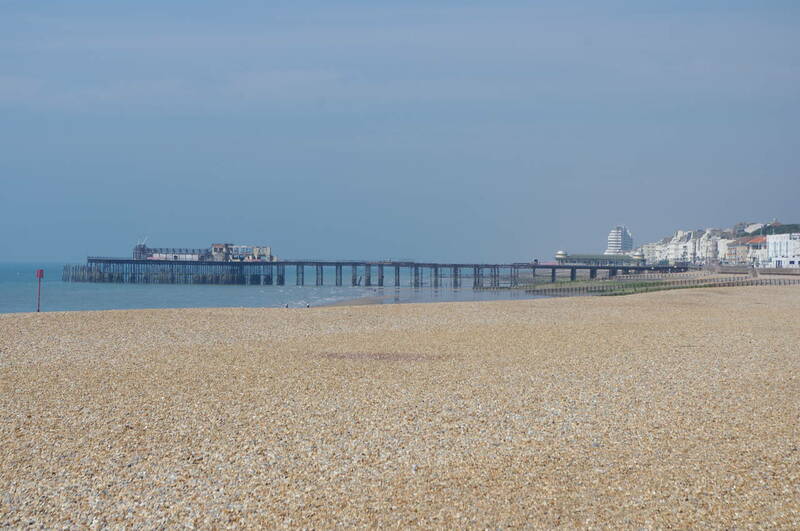 Heading across the shingle of Langney Point, I soon reached a bicycle path from which there were good views across to Beachy Head on the other side of Eastbourne (picture 31). 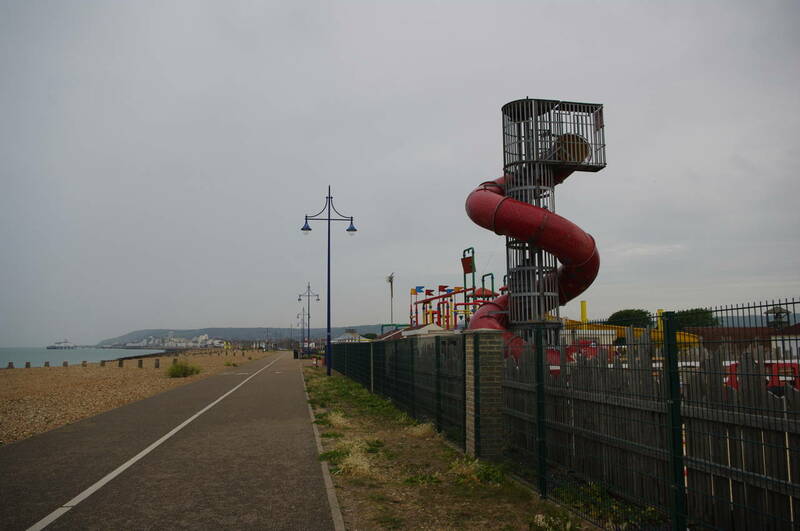 The bicycle path follows the coast past the long and narrow Sovereign Park and by the time I was passing a small amusement park called Fort Fun (picture 32), it was beginning to rain. The bicycle path continues past several large parking areas and some tennis courts before curving around some buildings where many small boats were pulled up on the beach. 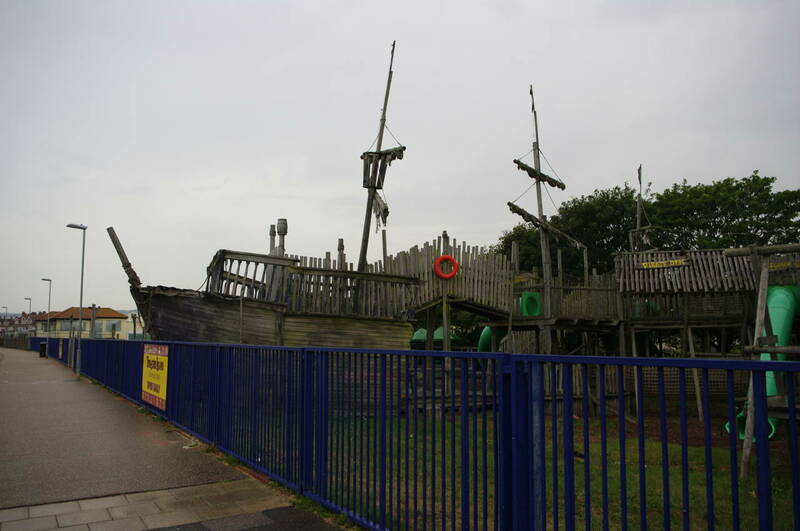 Just past the buildings, the Treasure Island Adventure Park (picture 33) was devoid of adventurers in the gradually worsening weather. 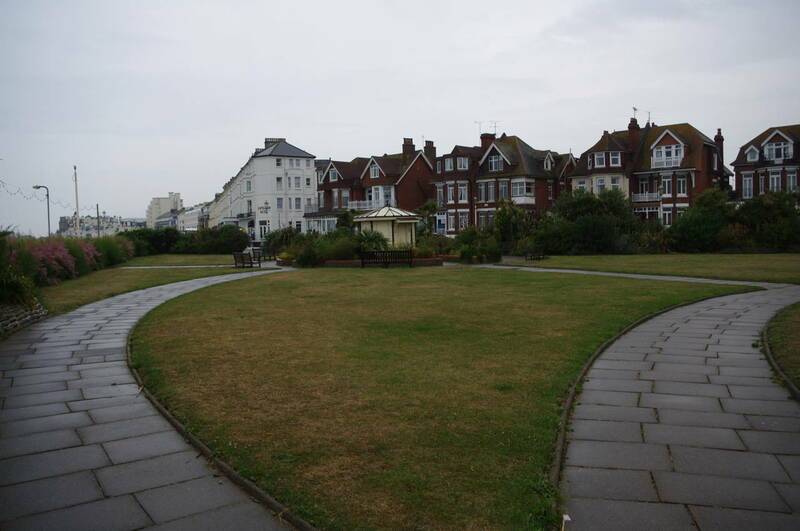 A short distance later the beach-side path passes the circular Redoubt fortress and next door Princes Park (picture 34), before passing a long line of beachfront hotels on the final stretch of path approaching Eastbourne Pier (picture 35) where the walk ends under the landward end of the pier (picture 36). My GPS showed 27.7km covered since starting the walk at Hastings. 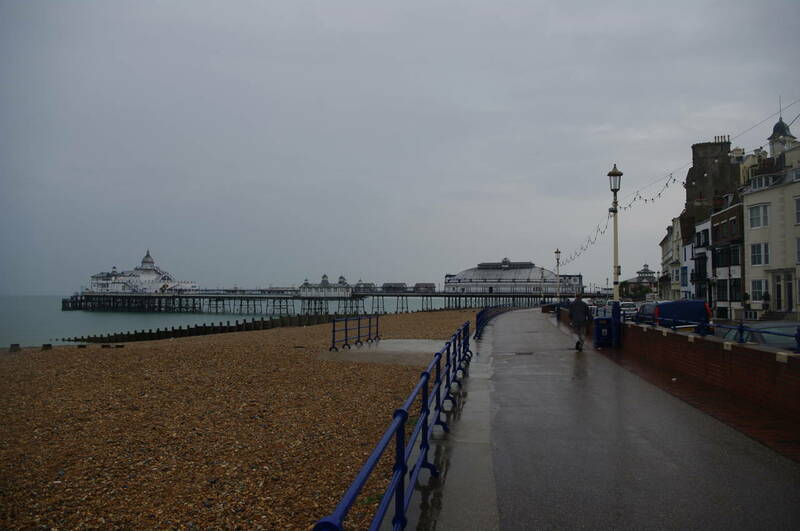 Despite the late rain and a significant amount of strenuous walking along the shingle shore, it had been a good day's walking with an interesting mix of urban and more isolated coastal landscapes.